Minister Michael Ring TD meeting with Irene McLoughlin (Glenisland); Martin Healy (VTC Castlebar, Western Care) and Joan Carden (Reeling Street, Ballina) on a visit to Western Care headquarters, Castlebar, Co. Mayo. Photo : Keith Heneghan. 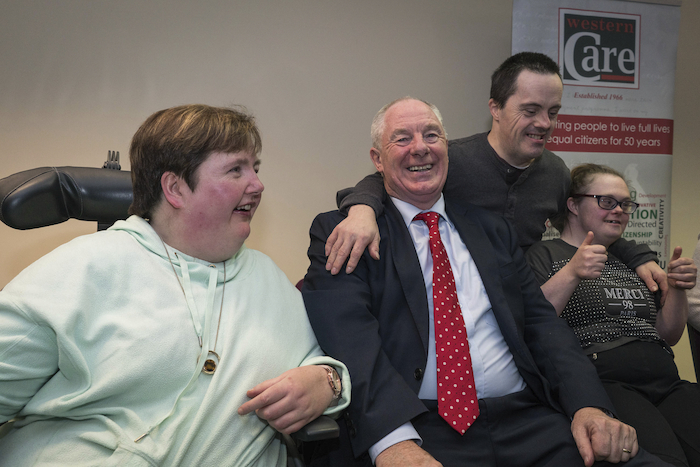 Minister for Rural and Community Development, Michael Ring, announced during an event at Western Care Castlebar this week, that he has allocated €223,579.50 in funding to six community care organisations in Mayo, which provide Mobility and Cancer Care transport to individuals in the community. The funding has been allocated under Measure 4 of the Department of Rural and Community Development’s CLÁR programme and will support voluntary organisations that provide: (1 ) Transport to/from designated cancer treatment hospitals/centres under the National Cancer Care Programme and (2 ) Transport for people with significant mobility issues, including those requiring specialised wheelchair accessible vehicles, to day-care or other medical, therapeutic or respite services. The six Mayo organisations to receive funding are: (1 ) Western Care Association (Ballina - serving Lacken, Swinford, Attymass and more ); (2 ) Western Care Association (Castlebar - serving Kiltimagh, Balla, Mayo Abbey, Ballinrobe ); (3 ) Foxford & District Alzheimers Trust; (4 ) Irish Wheelchair Association; (5 ) Irish Wheelchair Association, Belmullet and (6 ) Western Care Association, Belmullet Day Service. Announcing the successful applicants, Minister Ring stated: "I am delighted to announce this funding, through the CLÁR programme, to support voluntary organisations that provide transport services to some of the most vulnerable people in our society. This funding will provide vehicles that will enable people living in rural areas to travel to medical care or respite centres free of charge. "The provision of this funding is another demonstration of the Government’s commitment to supporting rural communities and comes on top of €574,166 which I have already allocated under the CLÁR programme this year. I am delighted to be able to support voluntary groups who provide transport to our sick and vulnerable citizens in order to enable them to access treatment and services." The Minister continued: "The difference which the provision of these vehicles will make to the lives of families in remote rural areas who have to attend day care or medical services is incalculable. Having access to a wheelchair accessible vehicle in your area can mean the difference between being able to avail of day care, respite and other services, or being confined to home. It’s as simple as that." Minister Ring concluded: "One of the strategic objectives of the Government’s Project Ireland 2040 strategy is to strengthen rural economies and communities. The CLÁR programme is helping to improve quality of life in rural communities and is an important part of the Government’s integrated strategy for rural development, which will also be supported through the new Rural Regeneration and Development Fund. This Fund will provide an additional €1 billion to be invested directly into rural communities by my Department up to 2027."